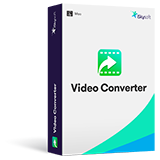 Convert 150+ video or audio formats. Convert video with full quality maintained. Load files directly from devices or camcorders. Convert home DVDs to different formats. Copy DVD file as a backup. Burn video to DVD folder or ISO files. Download online videos from 1,000+ sites. Trim, crop, rotate videos or add effects. Transfer converted or downloaded video to devices. Convert videos or photos to GIF. Record video or music from any online website.